Speech considered anti-war or anti-American was regulated on the home front during the World War I era. Violations led to arrests and convictions. Pacifists, socialists, and immigrant workers were particularly monitored for disloyal speech. The legal authority for these actions flowed from the Espionage Act of 1917 and the Sedition Act of 1918. Does free speech exist in a time of war? What kinds of “speech” were limited during WWI? Why was free speech restricted? What were the possible penalties for those who violated the regulations? How did different people respond to the limitation on speech at the time? “Extra! 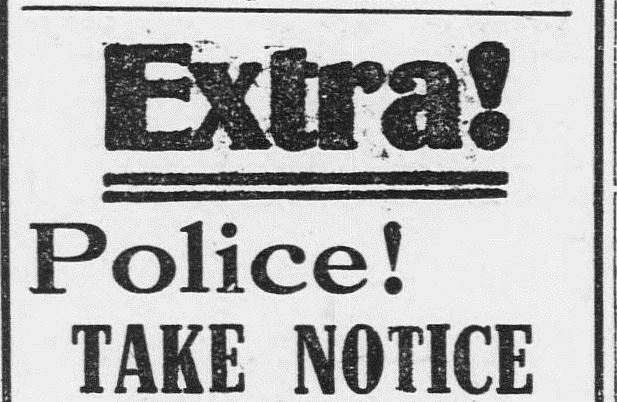 Police Take Notice” Bridgeport Times and Evening Farmer, April 23, 1918. Chronicling America: Historic American Newspapers, Library of Congress. 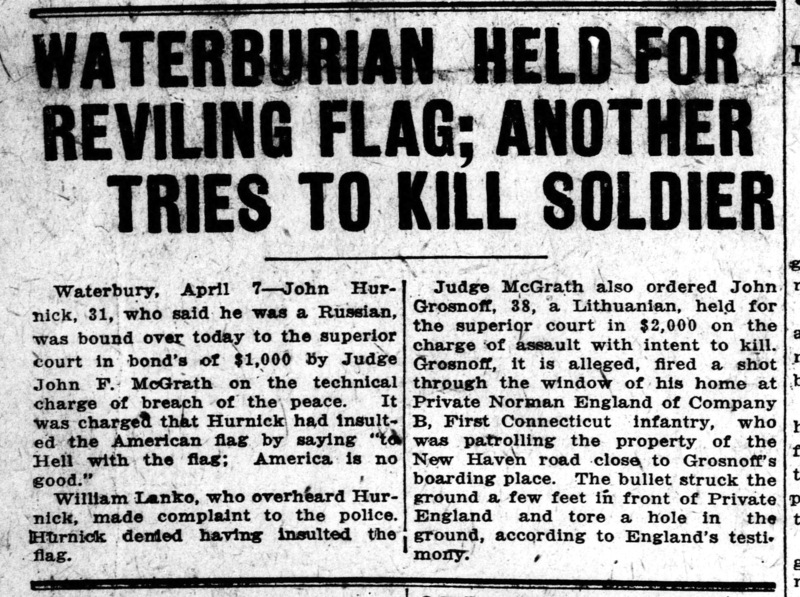 “Waterburian Held for Reviling Flag; Another Tries to Kill Soldier,” Bridgeport Evening Farmer, April 7, 1917. Library of Congress, Chronicling America: Historic American Newspapers. 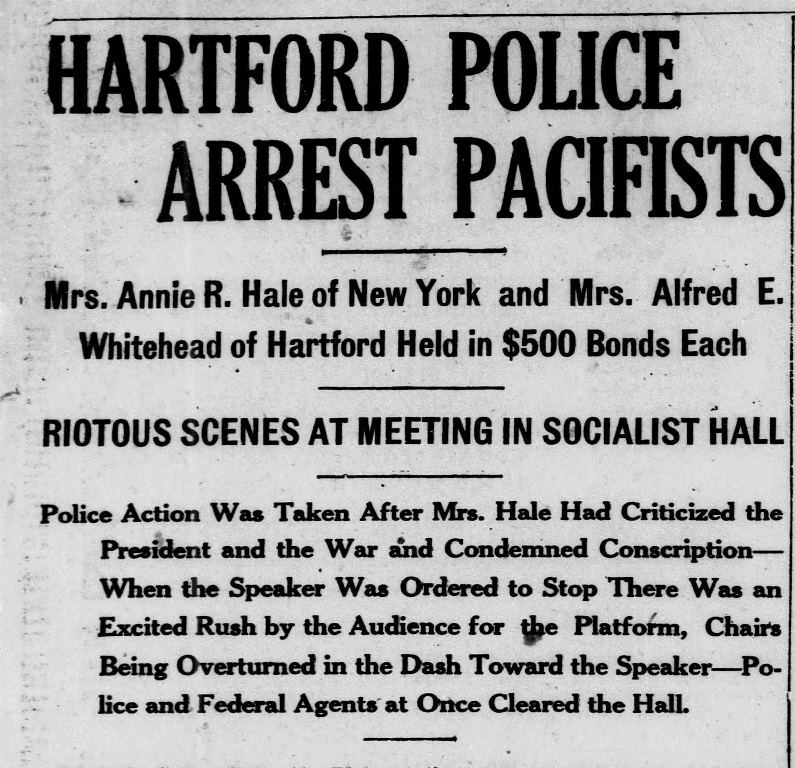 “Hartford Police Arrest Pacifists,” Norwich Bulletin, September 17, 1917. Click on the image to read the entire article. Library of Congress, Chronicling America: Historic American Newspapers. 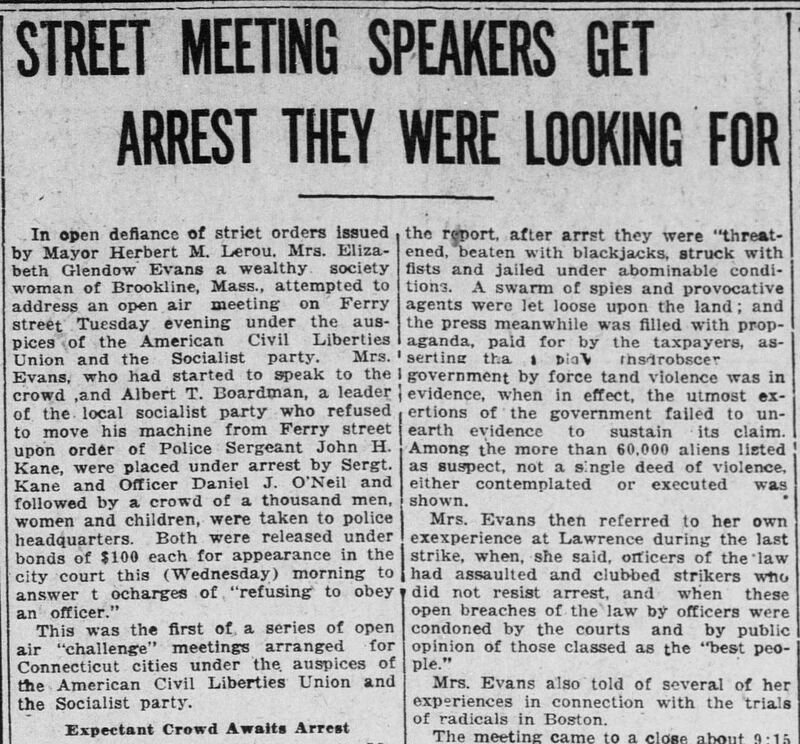 “Street Meeting Speakers Get Arrest They Were Looking For,” Norwich Bulletin, October 13, 1920. Library of Congress, Chronicling America: Historic American Newspapers. Who accused people of “seditious” or anti-American speech? What kinds of people were accused? Discuss questions that have emerged from the sources and where students could find answers or learn more. Students will select a person mentioned in one of the sources (a “concerned citizen,” law enforcement, protestor/accused citizen) and defend his or her position in a debate with classmates on the question of freedom of speech and censorship during World War I. Students, acting as if they were a resident of Connecticut from 1917 through 1921, will write a letter to the editor of either the Norwich Bulletin or the Bridgeport Evening Farmer/Bridgeport Times in reaction to any of the primary sources provided. Students will investigate events/topics related to free speech today—especially those involving national security—and write a letter to the editor of a contemporary newspaper placing these events into historical context and presenting lessons that could be drawn from the regulation of speech over time in America. ConnecticutHistory.org: Early 20th-Century Immigration in Connecticut, War and the Fear of Enemy Aliens – Who Knew?